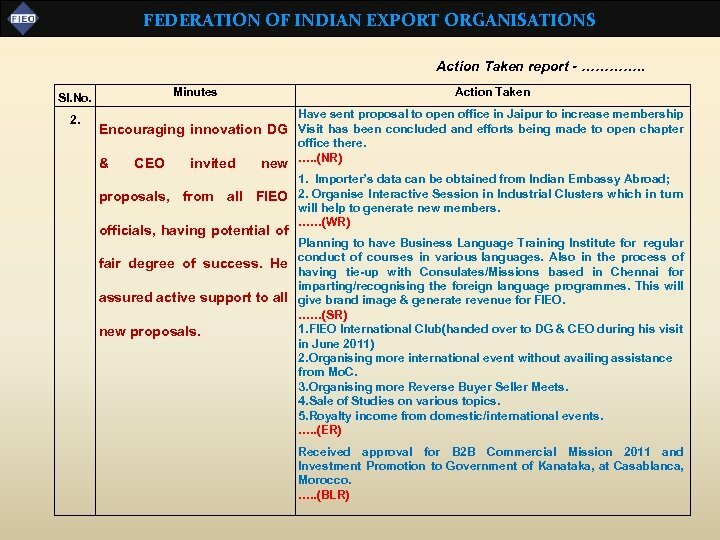 FEDERATION OF INDIAN EXPORT ORGANISATIONS Action Taken report - …………. . Dir (IT) 10. Action Taken Based on the views of the field offices, DG & CEO directed Director(IT) to update the Work instruction of organizing workshops/seminars such that Press release is not issued in all cases. Decision to issue/not issue will remain with the regional/ chapter head. 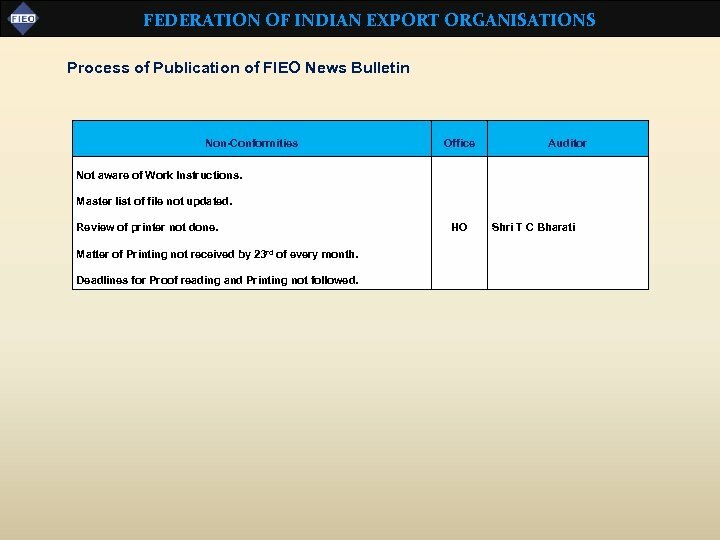 DG & CEO advised to maintain status quo with the objective to generate more press releases from all FIEO offices. 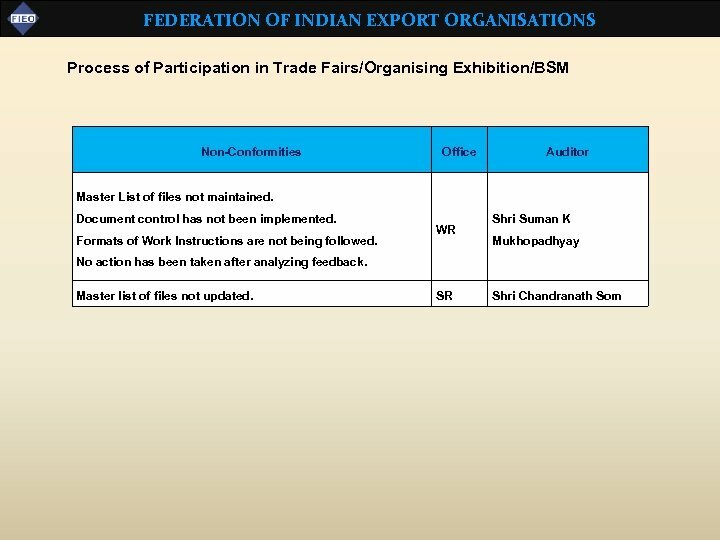 FEDERATION OF INDIAN EXPORT ORGANISATIONS Action Taken report - …………. . Sl. No. 13. 14. 15. 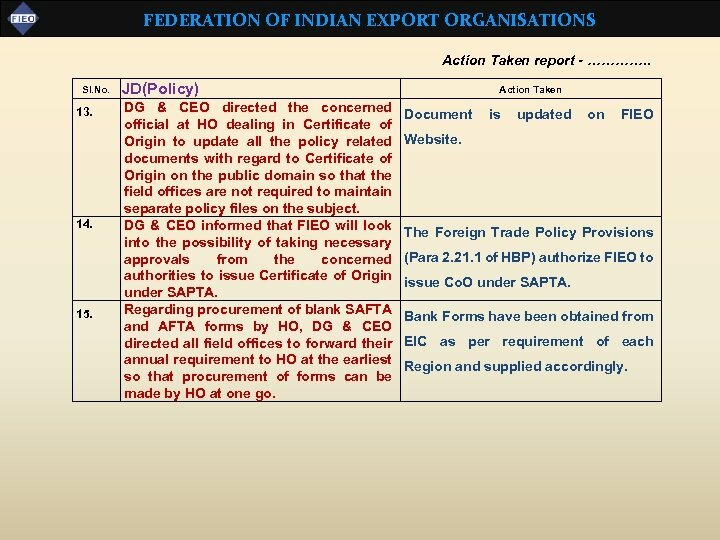 JD(Policy) DG & CEO directed the concerned official at HO dealing in Certificate of Origin to update all the policy related documents with regard to Certificate of Origin on the public domain so that the field offices are not required to maintain separate policy files on the subject. DG & CEO informed that FIEO will look into the possibility of taking necessary approvals from the concerned authorities to issue Certificate of Origin under SAPTA. 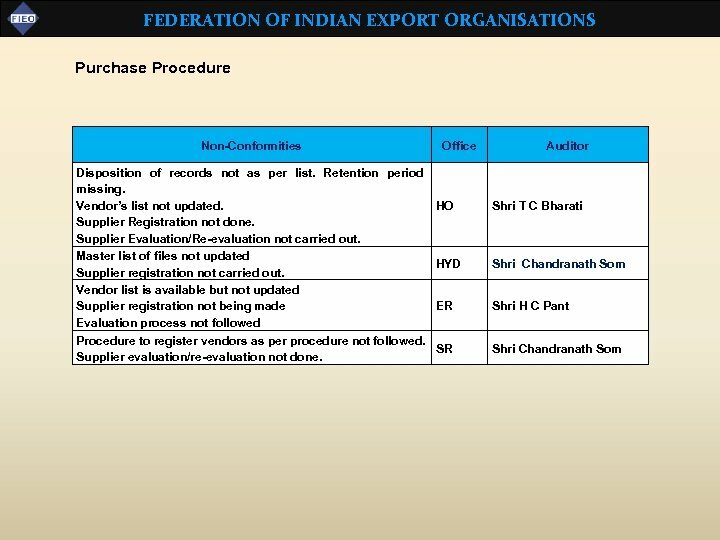 Regarding procurement of blank SAFTA and AFTA forms by HO, DG & CEO directed all field offices to forward their annual requirement to HO at the earliest so that procurement of forms can be made by HO at one go. 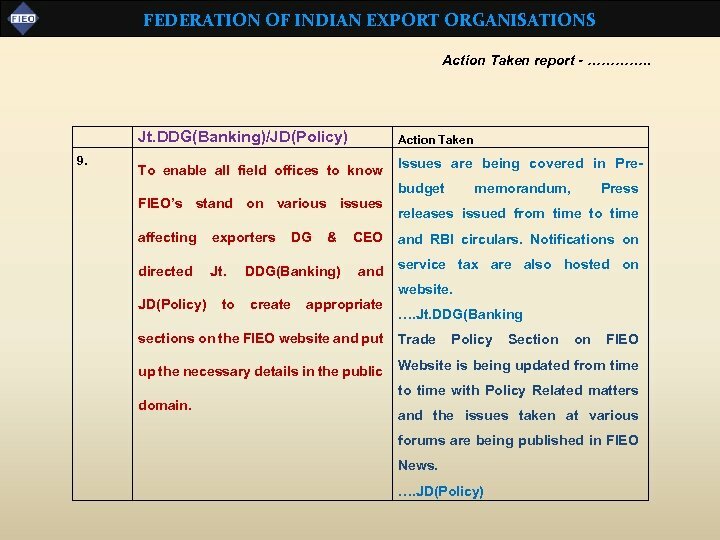 Action Taken Document is updated on FIEO Website. 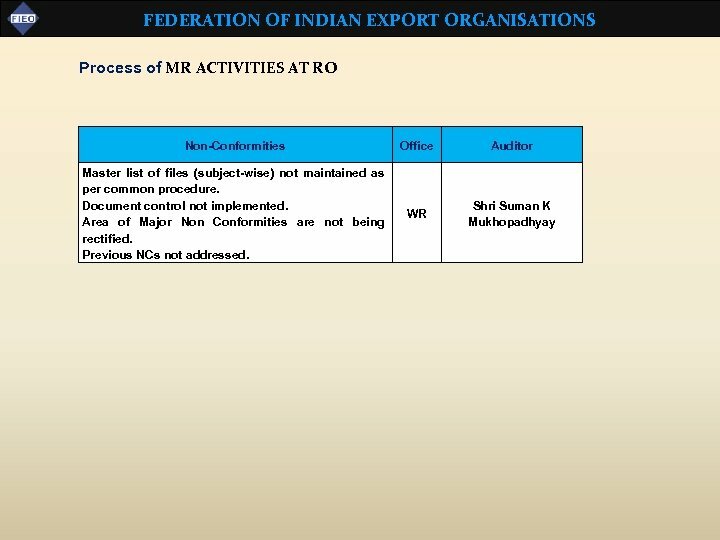 The Foreign Trade Policy Provisions (Para 2. 21. 1 of HBP) authorize FIEO to issue Co. O under SAPTA. Bank Forms have been obtained from EIC as per requirement of each Region and supplied accordingly. 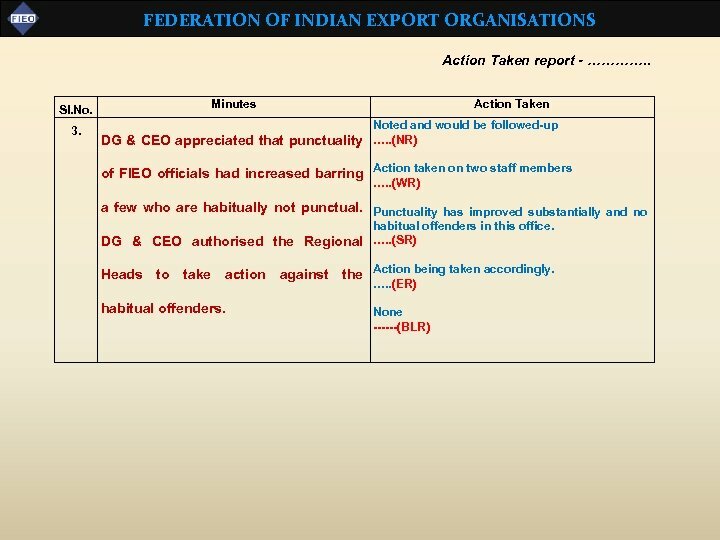 FEDERATION OF INDIAN EXPORT ORGANISATIONS Action Taken report - …………. . JD(ADM) 17. 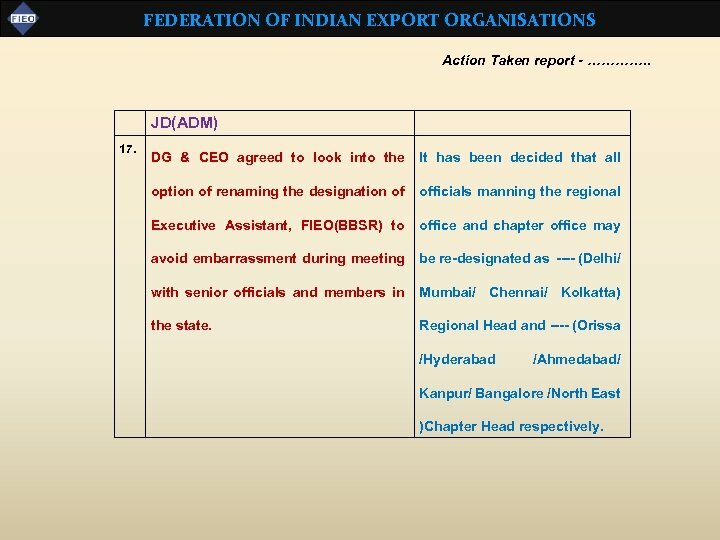 DG & CEO agreed to look into the It has been decided that all option of renaming the designation of officials manning the regional Executive Assistant, FIEO(BBSR) to office and chapter office may avoid embarrassment during meeting be re-designated as ---- (Delhi/ with senior officials and members in Mumbai/ Chennai/ Kolkatta) the state. Regional Head and ---- (Orissa /Hyderabad /Ahmedabad/ Kanpur/ Bangalore /North East )Chapter Head respectively. 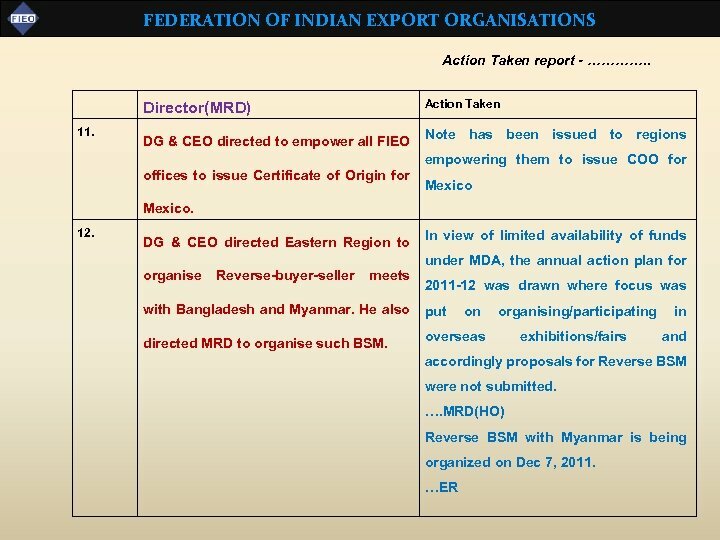 FEDERATION OF INDIAN EXPORT ORGANISATIONS Action Taken report - …………. . DD(DG Cell) 19. DG & CEO directed to put up detailed proposal to organize road show to increase membership in Northern Region. I. Interacting with non members/members during industrial visits to various locations - Ahmedabad, Vadodara and Gandhinagar. Creating awareness on FIEO’s services and activities. Taking their feedback on them. With the support of Regional/Chapter Offices reaching out to Govt. Depts. 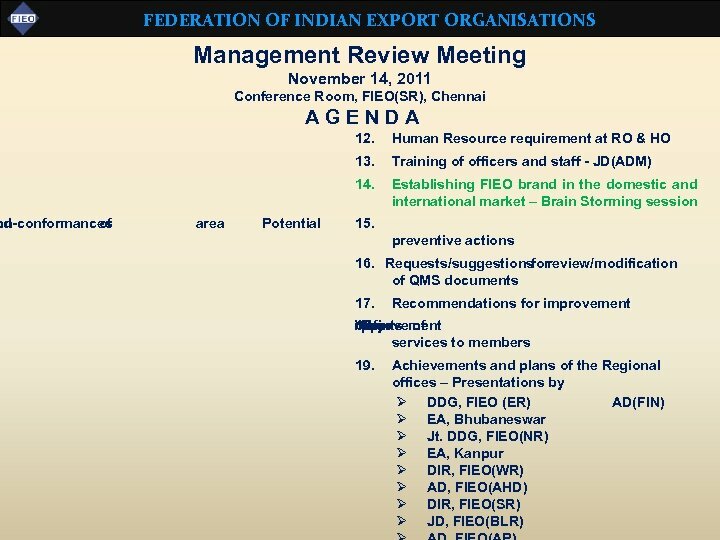 – widening reach to other than trade/EXIM related depts to brand FIEO as an all encompassing Organisation. II. 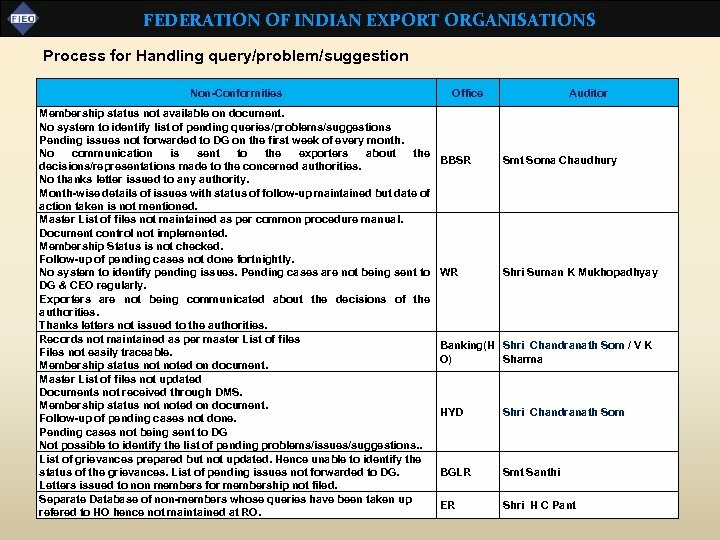 Planning to hold interactive sessions with nonmember/member exporters to understand their issues in their sectors. 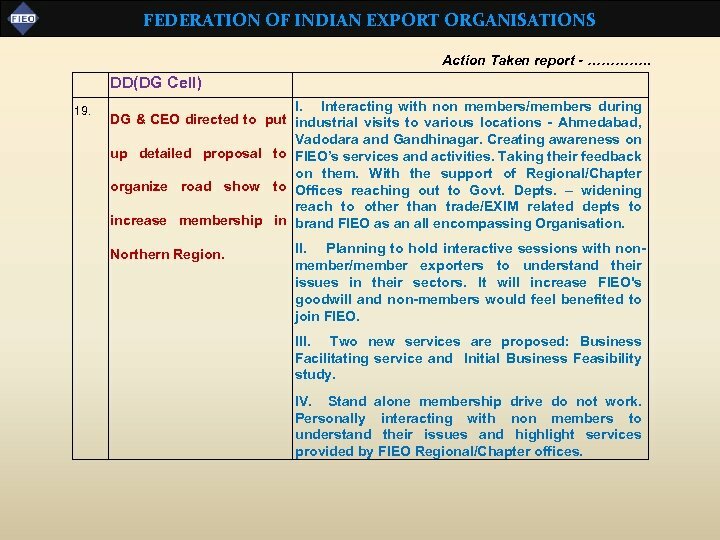 It will increase FIEO's goodwill and non-members would feel benefited to join FIEO. III. Two new services are proposed: Business Facilitating service and Initial Business Feasibility study. IV. Stand alone membership drive do not work. Personally interacting with non members to understand their issues and highlight services provided by FIEO Regional/Chapter offices. 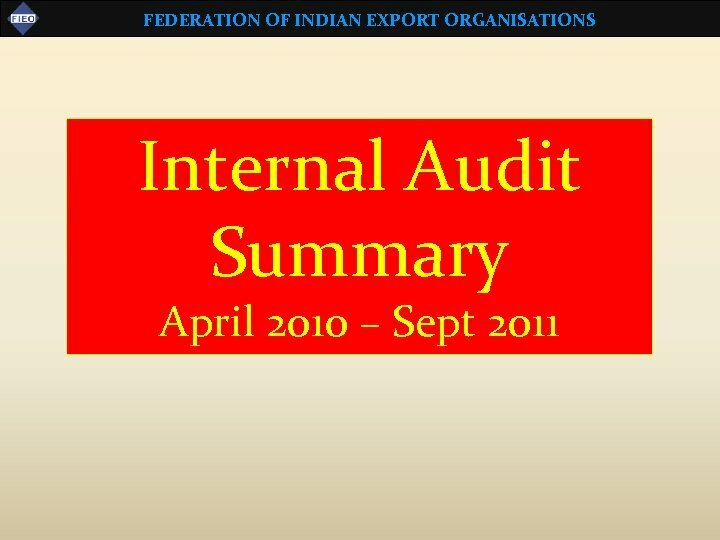 FEDERATION OF INDIAN EXPORT ORGANISATIONS Action Taken report - …………. . Sl. No. 20. 21. 22. 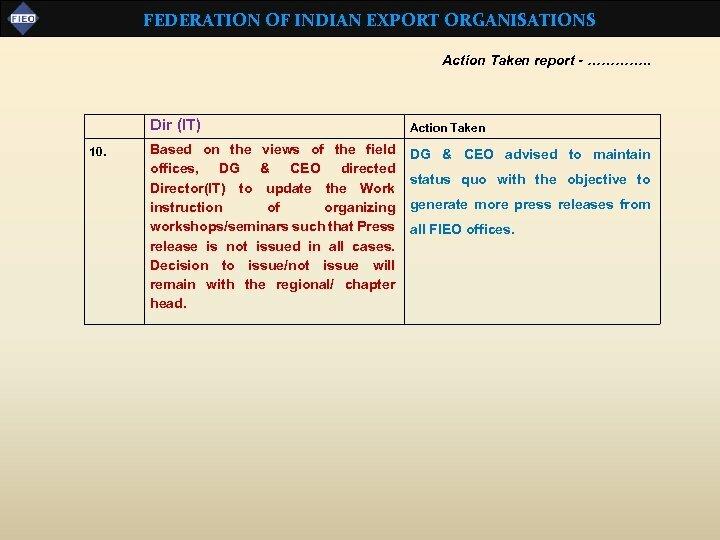 FIEO (ER) DG & CEO directed FIEO(ER) to follow up with the concerned authorities and ensure that they are included in the SLEPC of Bihar, Jharkhand West Bengal. DG & CEO directed FIEO (ER) to follow-up with Bihar and others and organize more programmes in association with the GM(DIC) and others. DG & CEO gave following specific target to FIEO(ER) for the year 2010 -11: Subscription collection to be enhanced to Rs 1 Crore No. 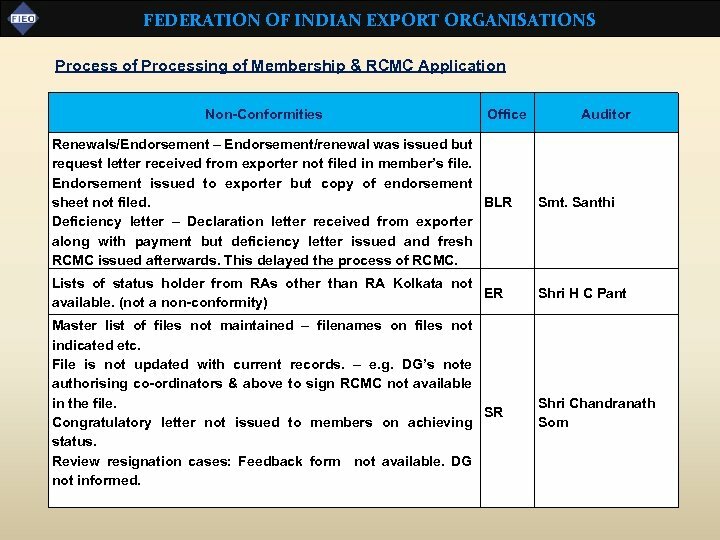 of member Export Houses to be increased to 200 Action Taken Already part of SLEPC committee in Orissa, Tripura & West Bengal. Letters written to Bihar and Jharkhand. Reply awaited. Follow ups being done on letters written. Reply awaited. Eight programmes finalised with West Bengal DICs scheduled from December till March 2012 on 8 th November 2011. 1 crore is not achievable only from subscription. Trying alternative revenue sources to fill the gap. Letters written to each of the status holders and vigorous telephone follow ups have been carried out. Second round follow up going on. Response is very poor. MPG registrations are more than status holders. FIEO(BBSR) 23. 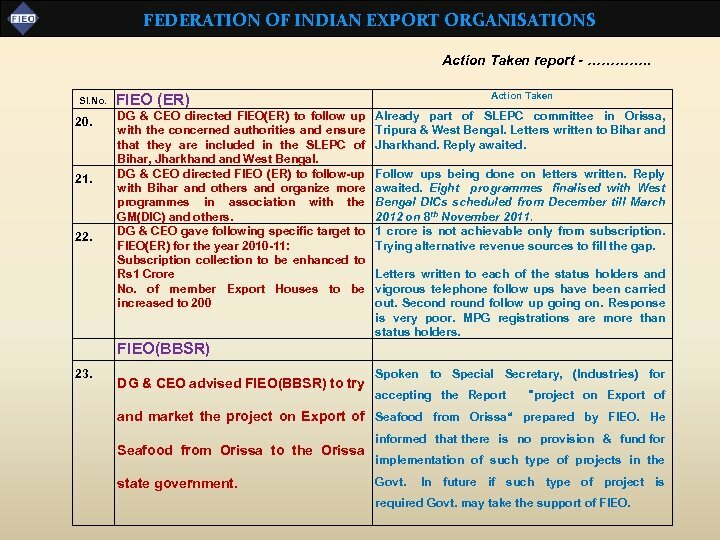 DG & CEO advised FIEO(BBSR) to try Spoken to Special Secretary, (Industries) for accepting the Report "project on Export of and market the project on Export of Seafood from Orissa“ prepared by FIEO. He Seafood from Orissa to the Orissa state government. informed that there is no provision & fund for implementation of such type of projects in the Govt. In future if such type of project is required Govt. may take the support of FIEO. 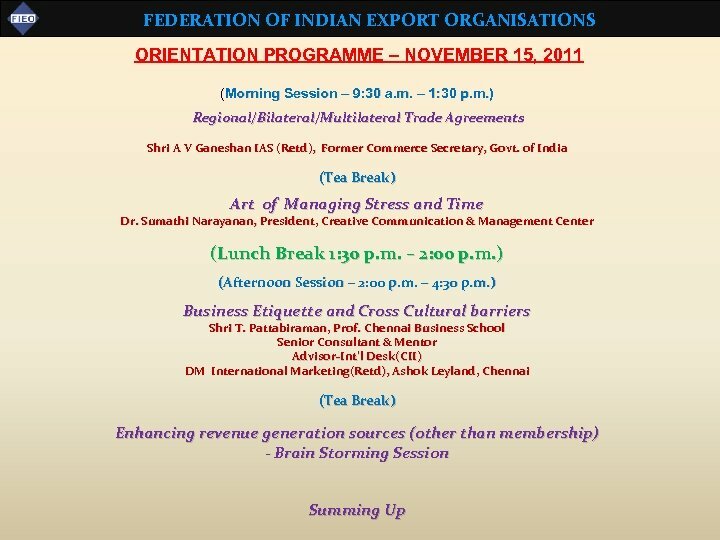 FEDERATION OF INDIAN EXPORT ORGANISATIONS Sl. No. 24. 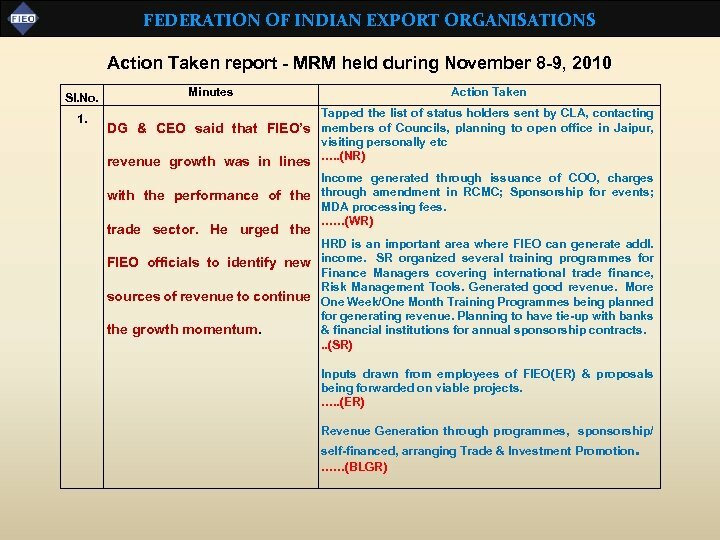 FIEO(SR) Action Taken report - …………. . Action Taken Tie-up with companies like Hyundai with Personally contacted companies like Hyundai, the objective to increase the numbers of Ashok Leyland Ltd. , etc. 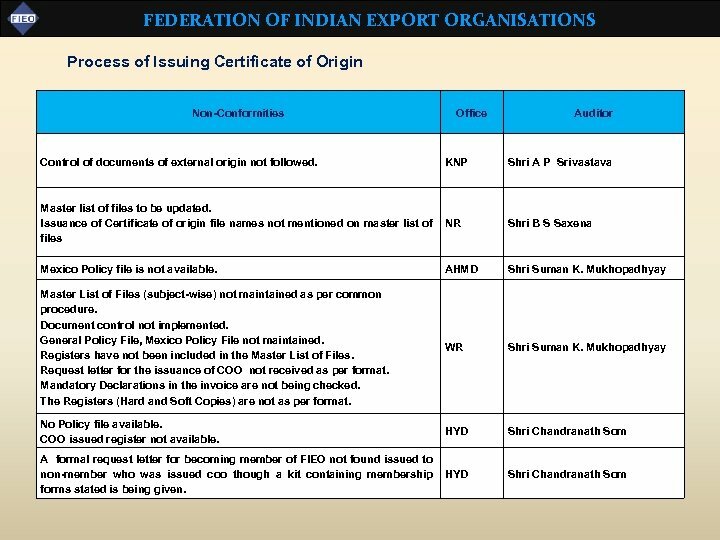 Due to locational factors it is not possible to get business from issuance of Certificate of Origins. these companies. With marketing efforts substantial growth in COO collection is visible: 07 -08 - Rs. 2, 760 08 -09 - Rs. 12, 800 09 -10 - Rs. 40, 200 10 -11 - Rs. 1, 07, 570 11 -12 - Rs. 1, 32, 550 (upto Oct. 2011) 25. 26. 27. With regard to conduct market surveys in Started preparation of survey & written association with the Indian missions to all Indian Missions abroad. Could not abroad etc. DG & CEO directed Western proceed further due to shortage of staff Region to get such surveys from EU- and workload of all staff members. Chamber of Commerce, Southern Region to get surveys for GCC countries and Request to consider 2 management trainee for Bangalore to get surveys from African SR. countries. DG & CEO informed that there are many Best efforts are on to convert non-member status holders in the Western and Southern status holders into members. Conversion rate Regions who are not registered with FIEO. is not very encouraging. Next fiscal with vigorous followups and more activities better He directed both the regional heads to growth is expected. follow-up aggressively and ensure that their enrollment with FIEO increase. In view of the diminishing numbers of Organized events in all major districts of members in Kerala, DG & CEO directed Kerala with the aim to increase membership. 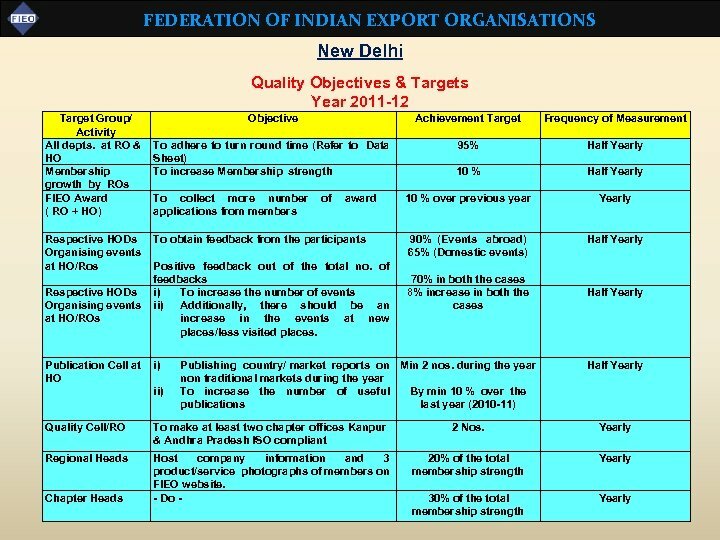 FIEO(SR) to increase the number of events During current year there is 15% increase in membership compared to last year. Activities in the state. in the State have been doubled. Expect to have higher growth. 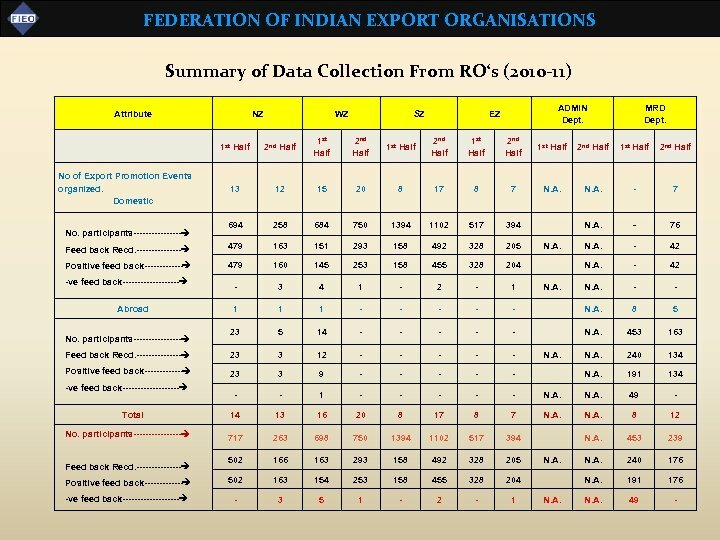 FEDERATION OF INDIAN EXPORT ORGANISATIONS Action Taken report - …………. . Sl. No. 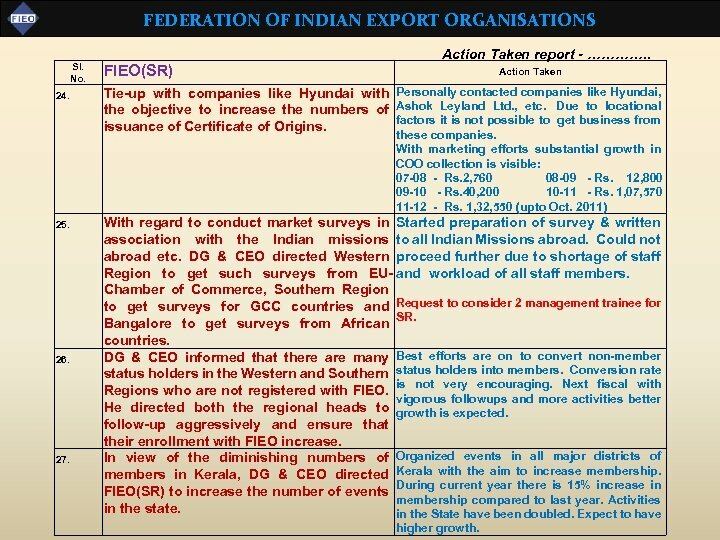 FIEO(BLR) Action Taken 28. Regarding the proposal from Director(SR) to give his views. 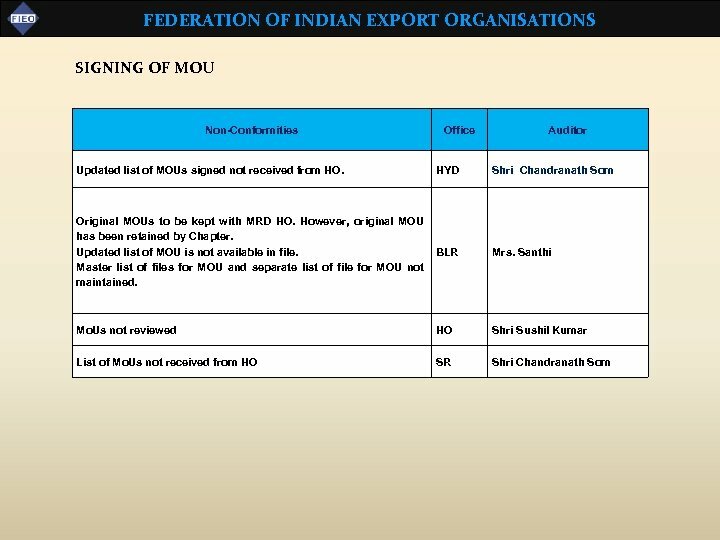 Bangalore office to organize Part-Time Certified Course on Diploma in Foreign Trade sent to HO, DG & CEO directed Director(SR) to review the proposal and put up once again. 29. With regard to conduct market Industry and World United Chamber of Commerce & Industry surveys in association with organised incoming High Power Trade Delegation from Sierra In collaboration with Europe India Chamber of Commerce & the Indian missions abroad etc. DG & CEO directed Western Region to get such surveys from EU-Chamber of Commerce, Southern Region to get surveys for GCC countries and Bangalore to get surveys from African countries. Leone at Bangalore to promote JV in the fields of Integrated Sericulture, Railway Coaches, Gem and Jewellery. Efforts made for out going trade delegation from Bangalore, to Casablanca, Morocco during October, 2011 with the support of Karnataka Govt. It was overwhelmed by exporters of the Region. Due to technical reasons programme has been postponed. Working for revised date. Received communication from High Powered Trade Delegation headed by Vice President, Sierra Leone along with 20 delegates to Bangalore during December 2011/January 2012 for further Joint Venture promotion of Soil to Sericulture in collaboration with Central Silk Board. Proposed to invest US$ 50 mn Expected to stay in Bangalore - 3 days; New Delhi -2 days; Mumbai - 2 days. 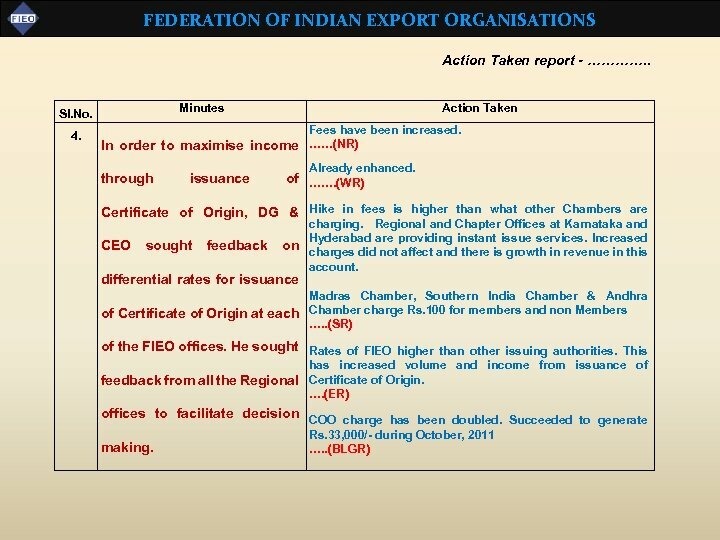 FEDERATION OF INDIAN EXPORT ORGANISATIONS Action Taken report - …………. . Sl. No. 30 31 32 33 34 Action Taken DIR(WR) With regard to the manpower requirement at FIEO(WR), DG & CEO directed Jt. DDG(WR) to send a comparative statement of the employee strength during 2007 -08 vis-à-vis the current. With regard to conduct market surveys in association with the Indian missions abroad etc. 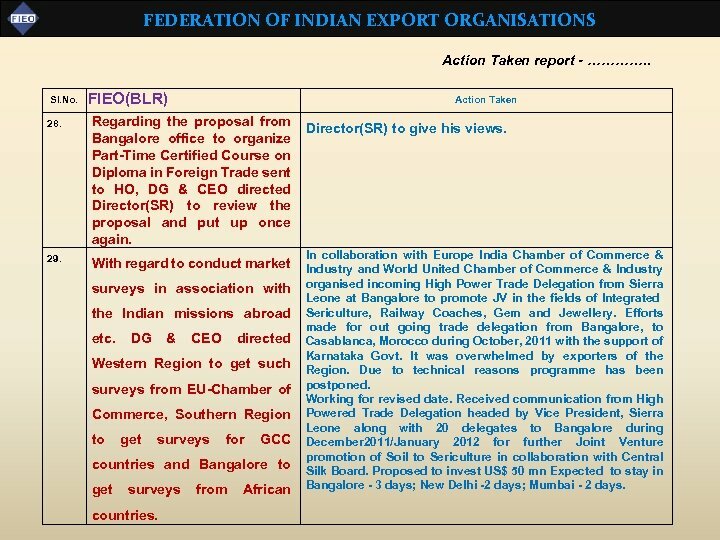 DG & CEO directed Western Region to get such surveys from EU-Chamber of Commerce, Southern Region to get surveys for GCC countries and Bangalore to get surveys from African countries. 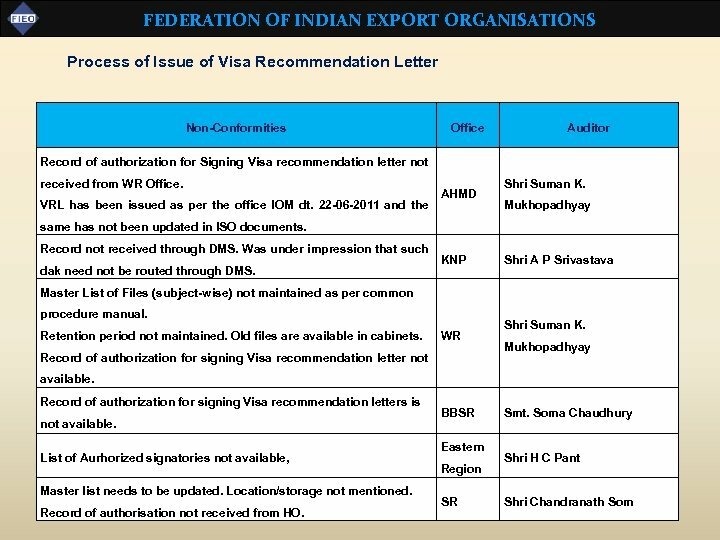 Western Region office to authorize Ahmedabad Chapter to begin all work pertaining to issuing visa recommendation letter/MDA as per the respective guidelines. DG & CEO informed that there are many status holders in the Western and Southern Regions who are not registered with FIEO. 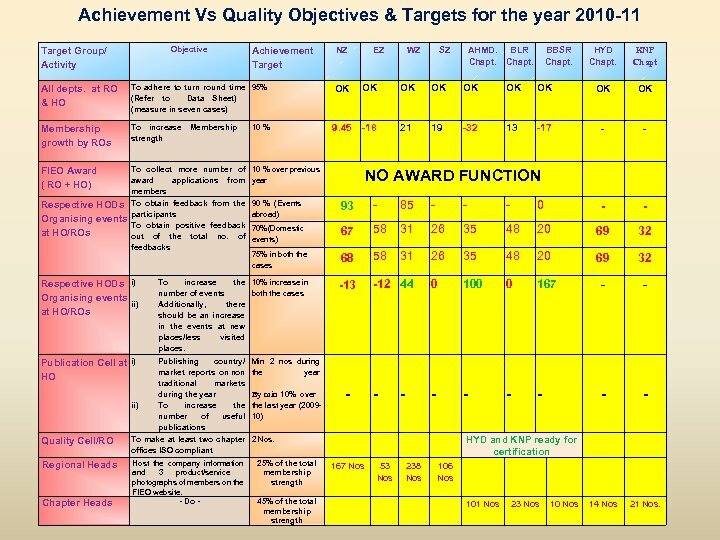 He directed both the regional heads to follow-up aggressively and ensure that their enrollment with FIEO increase. Already sent. 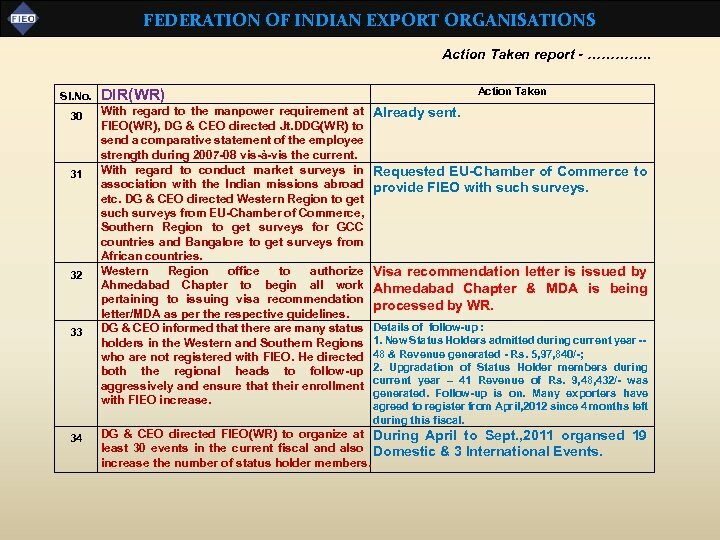 Requested EU-Chamber of Commerce to provide FIEO with such surveys. 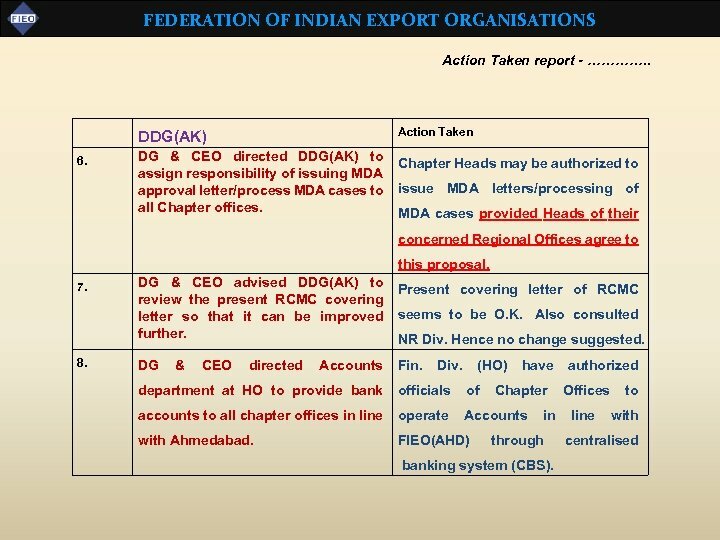 Visa recommendation letter is issued by Ahmedabad Chapter & MDA is being processed by WR. Details of follow-up : 1. New Status Holders admitted during current year -- 48 & Revenue generated - Rs. 5, 97, 840/-; 2. Upgradation of Status Holder members during current year – 41 Revenue of Rs. 9, 48, 432/- was generated. Follow-up is on. 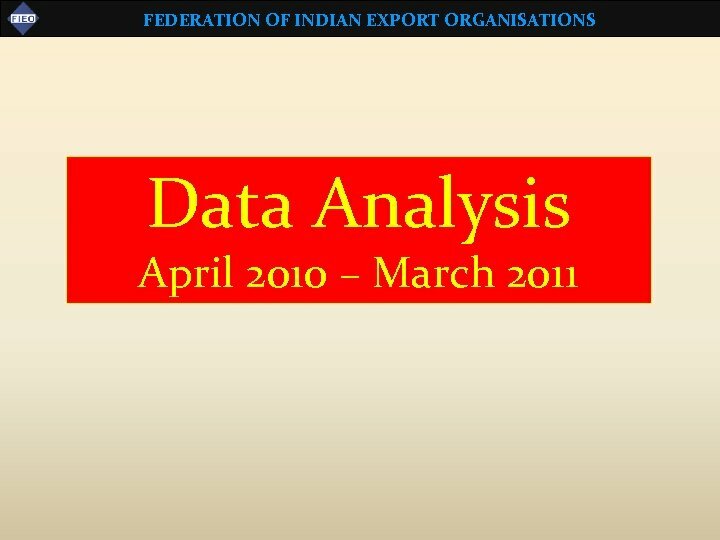 Many exporters have agreed to register from April, 2012 since 4 months left during this fiscal. 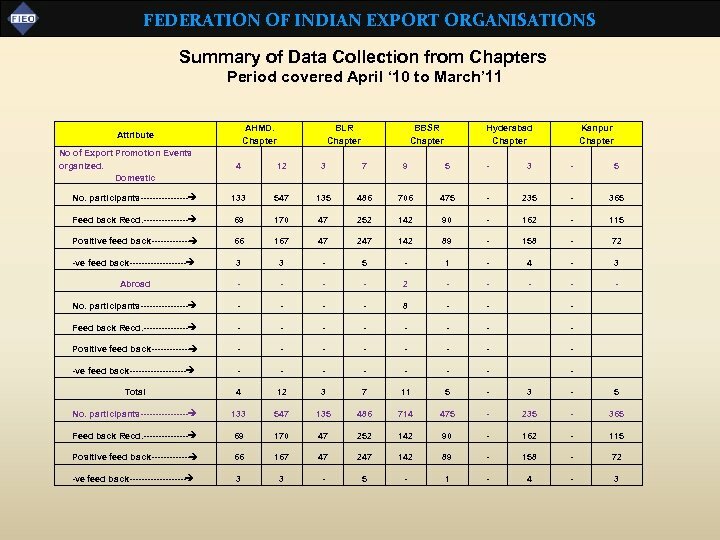 DG & CEO directed FIEO(WR) to organize at During April to Sept. , 2011 organsed 19 least 30 events in the current fiscal and also Domestic & 3 International Events. increase the number of status holder members. 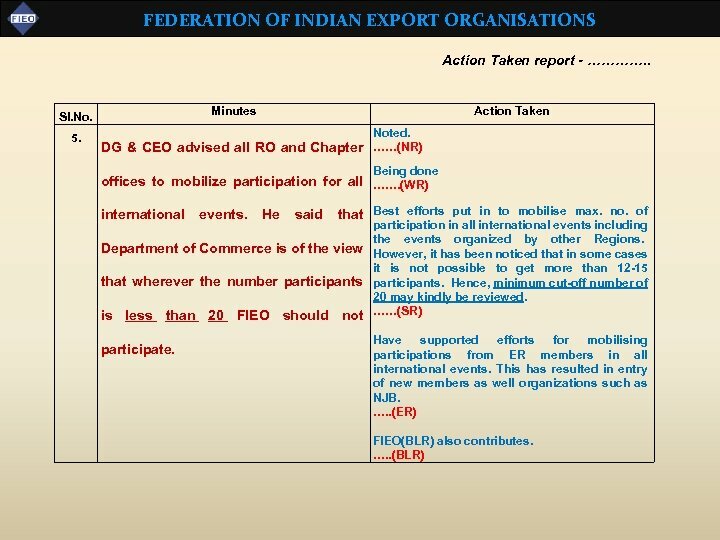 FEDERATION OF INDIAN EXPORT ORGANISATIONS Action Taken report - …………. . FIEO(AHD) 35. 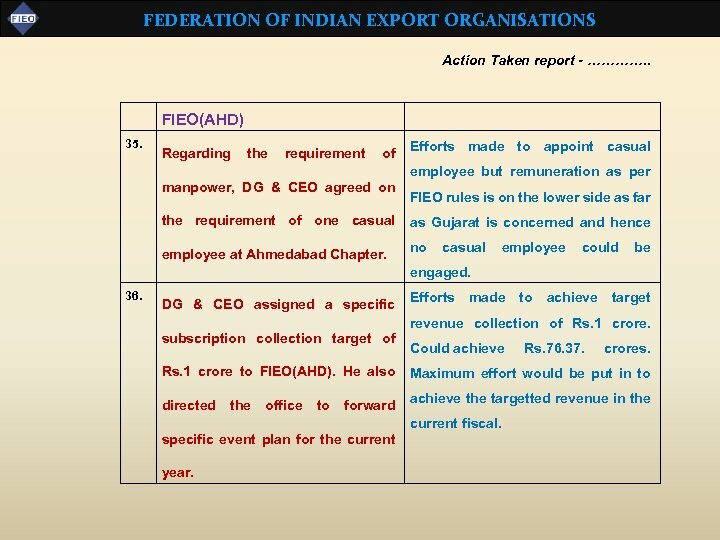 Regarding the requirement of Efforts made to appoint casual employee but remuneration as per manpower, DG & CEO agreed on FIEO rules is on the lower side as far the requirement of one casual as Gujarat is concerned and hence employee at Ahmedabad Chapter. no casual employee could be engaged. 36. DG & CEO assigned a specific Efforts made to achieve target revenue collection of Rs. 1 crore. subscription collection target of Could achieve Rs. 76. 37. crores. Rs. 1 crore to FIEO(AHD). He also Maximum effort would be put in to directed the office to forward achieve the targetted revenue in the current fiscal. specific event plan for the current year. 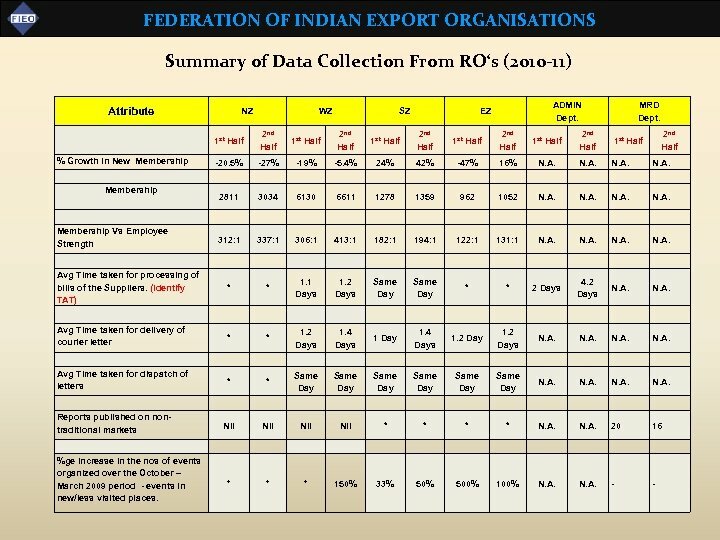 FEDERATION OF INDIAN EXPORT ORGANISATIONS Summary of Data Collection From RO‘s Period covered April ’ 10 to March’ 11 (Measured Half Yearly) Attribute NZ WZ SZ MRD EZ 1 st Half 2 nd Half 1 st Half 2 nd Half Avg Time taken for granting new RCMC & Membership (TAT-3 days) 1. 4 Days 1. 9 Days Same Day 1 Day Same Day N. A. Avg Time taken for Renewal of RCMC & Membership (TAT-3 days) 1 Day 1. 5 Days Same day Same Day * 1. 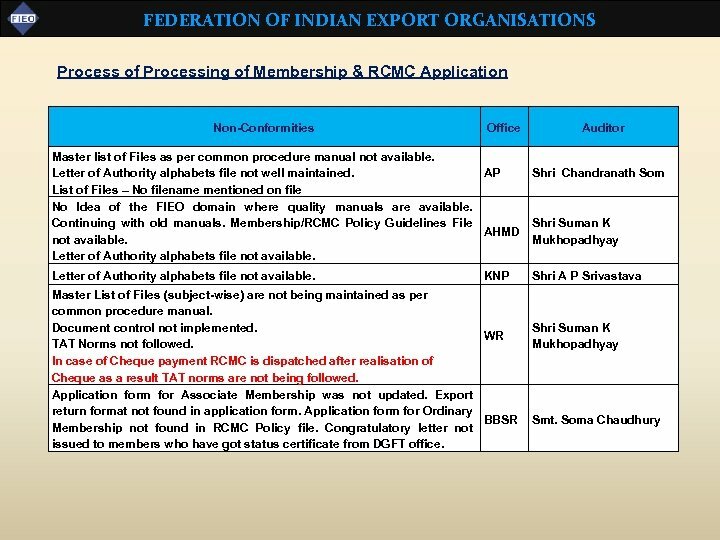 8 Days Same Day N. A. Avg Time taken for Incorporating changes/ amendments in RCMC (TAT-3 days) 1 Day Same Day 2. 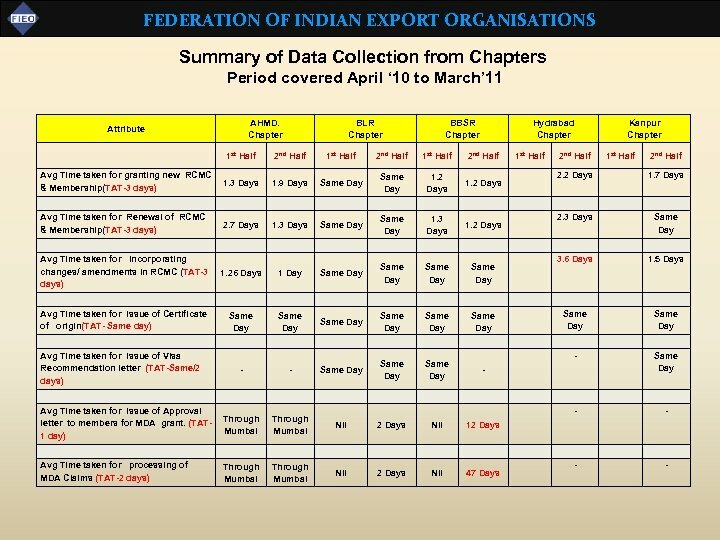 3 Days 2 Days Same Day N. A. Avg Time taken for Issue of Certificate of origin (TAT- Same day) Same Day Same Day N. A. Avg Time taken for Issue of Visa Recommendation letter (TAT-Same/2 days) Same Day Same Day Same Day Avg Time taken for Issue of Approval letter to members for MDA grant. (TAT 1 day) 1 Day 3. 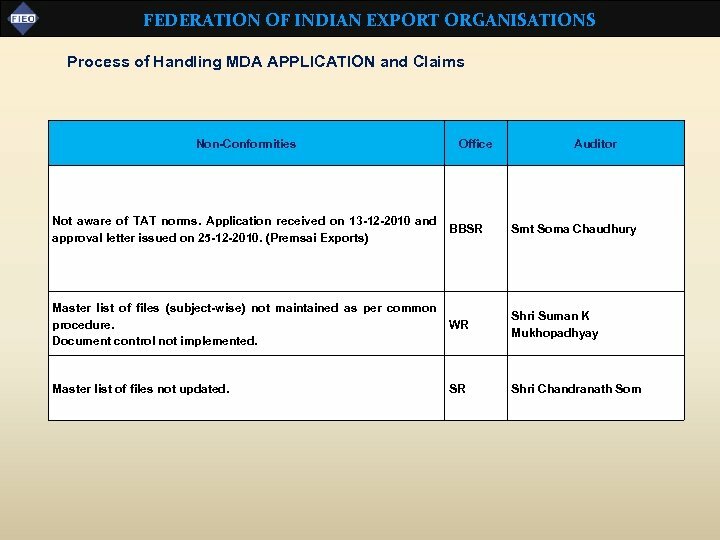 7 Days Same Day * * N. A. Avg Time taken for processing of MDA Claims (TAT-2 days) 2 Days 1. 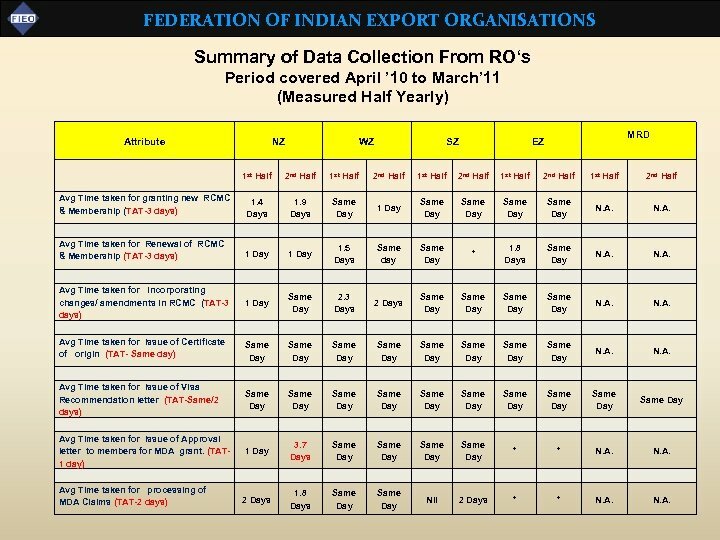 8 Days Same Day Nil 2 Days * * N. A.
FEDERATION OF INDIAN EXPORT ORGANISATIONS Summary of Data Collection From RO‘s (2010 -11) Attribute NZ WZ SZ ADMIN Dept. EZ MRD Dept. 1 st Half 2 nd Half 1 st Half 2 nd Half 13 12 15 20 8 17 8 7 N. A. - 7 694 258 684 750 1394 1102 517 394 N. A. - 76 Feed back Recd. -------- 479 163 151 293 158 492 328 205 N. A. - 42 Positive feed back------- 479 160 145 253 158 455 328 204 N. A. - 42 - 3 4 1 - 2 - 1 N. A. - - 1 1 1 - - - N. A. 8 5 23 5 14 - - - N. A. 453 163 Feed back Recd. -------- 23 3 12 - - - N. A. 240 134 Positive feed back------- 23 3 9 - - - N. A. 191 134 - - 1 - - - N. A. 49 - 14 13 16 20 8 17 8 7 N. A. 8 12 717 263 698 750 1394 1102 517 394 N. A. 453 239 502 166 163 293 158 492 328 205 N. A. 240 176 Positive feed back------- 502 163 154 253 158 455 328 204 N. A. 191 176 -ve feed back---------- - 3 5 1 - 2 - 1 N. A. 49 - No of Export Promotion Events organized. Domestic No. participants-------- -ve feed back---------- Abroad No. 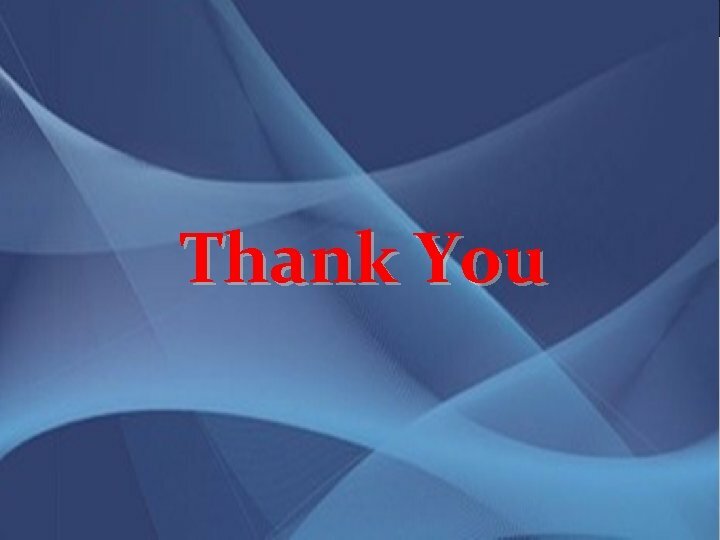 participants-------- -ve feed back---------- Total No. participants---------------- Feed back Recd. 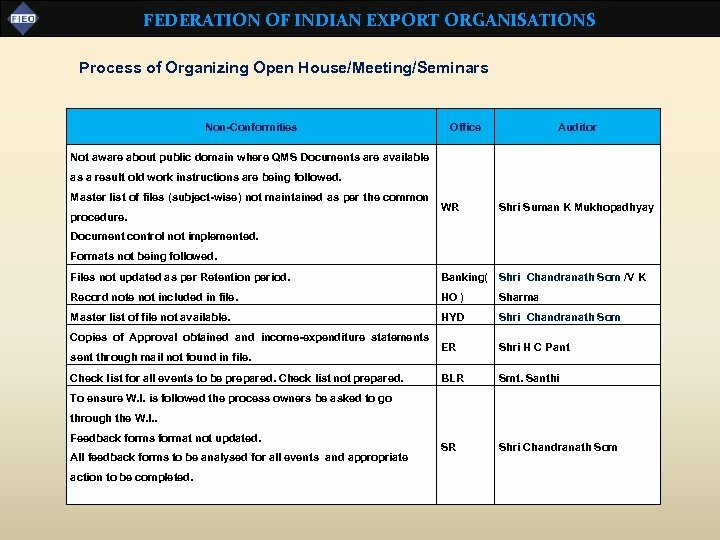 -------- N. A.
FEDERATION OF INDIAN EXPORT ORGANISATIONS Process of Organizing Open House/Meeting/Seminars Non-Conformities Office Auditor Not aware about public domain where QMS Documents are available as a result old work instructions are being followed. 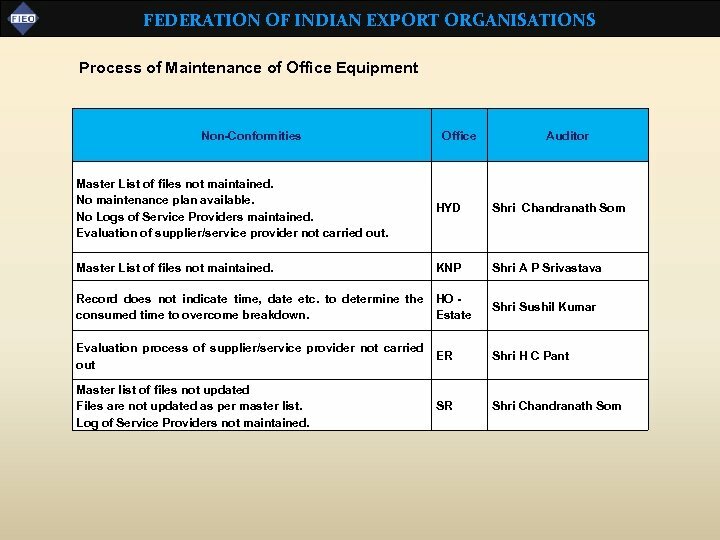 Master list of files (subject-wise) not maintained as per the common WR Shri Suman K Mukhopadhyay Files not updated as per Retention period. Banking( Shri Chandranath Som /V K Record note not included in file. 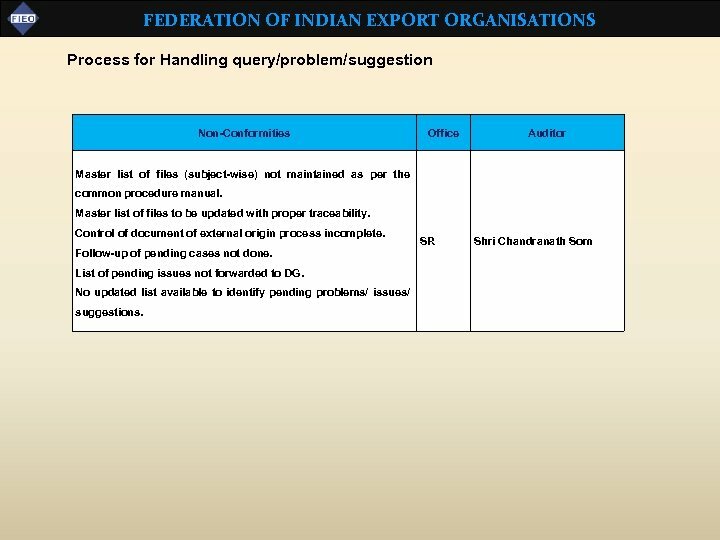 HO ) Sharma Master list of file not available. HYD Shri Chandranath Som ER Shri H C Pant BLR Smt. Santhi SR Shri Chandranath Som procedure. Document control not implemented. Formats not being followed. Copies of Approval obtained and income-expenditure statements sent through mail not found in file. Check list for all events to be prepared. Check list not prepared. To ensure W. I. is followed the process owners be asked to go through the W. I. . Feedback forms format not updated. All feedback forms to be analysed for all events and appropriate action to be completed. 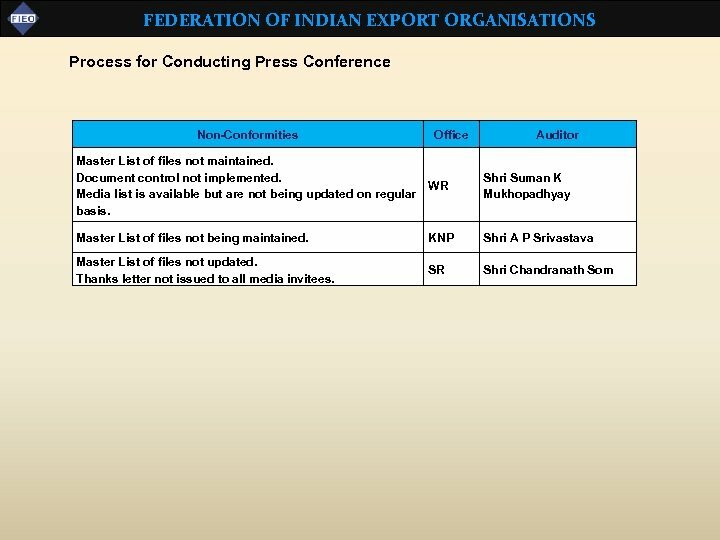 FEDERATION OF INDIAN EXPORT ORGANISATIONS MAKING OF PRESS RELEASES Non-Conformities Office Auditor HYD Shri Chandranath Som SR Shri Chandranath Som Master list of files not as per common procedure manual Master Press Release register not available. Press Clippings file not maintained. 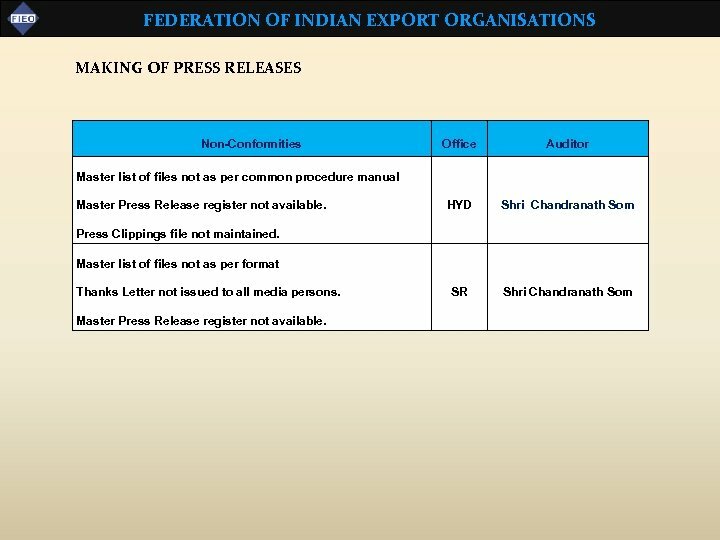 Master list of files not as per format Thanks Letter not issued to all media persons. Master Press Release register not available.